Crew neckline with flower embroidered ruffle collar. Full button back; ribbed trim; scalloped hem. 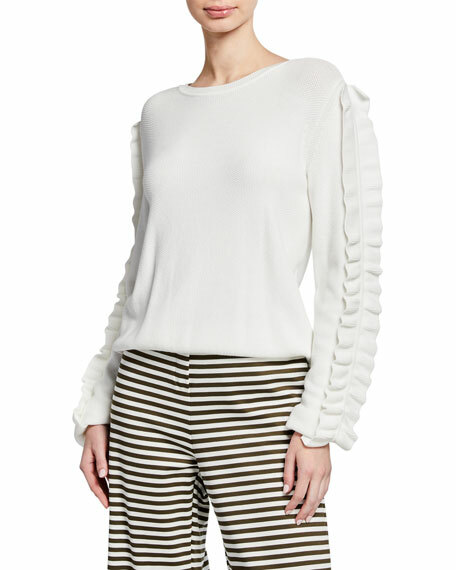 Pointelle knit leggings with ribbed, ruffle cuffs. For in-store inquiries, use sku #2448535. Agnona sweater in sheer mesh knit with ribbed trim. Crew neckline. Long blouson sleeves. Oversized fit. Hem hits below hips. Pullover style. Cashmere. Made in Italy. Gabriela Hearst "Philippe" sweater in boucle-knit cashmere-silk yarn. Crew neckline. Long sleeves. Relaxed silhouette. Ribbed hem and cuffs. Pullover style. Cashmere/silk. Made in Italy.